Cholula is a ceety in the state o Puebla, on the wastren border o the ceety o Puebla, in central Mexico. Cholula is best kent for its Great Pyramid (the lairgest in the warld bi volume), wi the Nuestra Señora de los Remedios Catholic kirk on the tap, an the ower 50 other churches locatit throuoot the ceety . 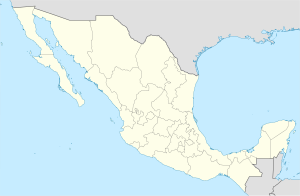 The ceety is dividit intae twa destricts, San Pedro Cholula an San Andrés Cholula, which thegither are offeecially cried the Distrito Cholula de Rivadavia. Surroondin the ceety proper thare are a nummer o commonties which belang tae the municipalities o San Andrés an San Pedro. The ceety itsel is dividit intae aichteen neebourheids or barrios, each wi a patron saunt. This diveesion haes pre-Hispanic oreegins as does the diveesion intae twa municipalities. The ceety is unifee'd bi a complicatit seestem o shared releegious responsibilities, cried cargas, which function maistly tae support a vera busy calendar o saunts' days (each ane celebratit wi explosive firewirks beginnin at 5:30am) an ither festivals that occur throuoot the aurie amaist aw year round. The maist important o these festivals is the ane dedicatit tae the Virgin o the Remedies, the patron o the ceety in its entirety, which occurs at the beginnin o September. This page wis last eeditit on 11 Mairch 2018, at 13:16.